It is an old Scandinavian tradition to make woven paper or felt hearts to fill with candies or nuts and put on the Christmas tree. The Christmas tree in Scandinavia is not as lavishly decorated as in the U.S. and instead it has mainly handmade ornaments, the Norwegian flag and Christmas heart baskets. Woven heart baskets are typically made from paper or felt in two contrasting colors, usually red and white and every school-age child in Norway knows how to make them by the age of 10. In fact, you can see the Christmas heart in all Scandinavian nations. Some Danes say it is the symbol of the heart of Christmas (love and respect) and was invented by Hans Christian Andersen in the late 19th Century. In the past, the hearts filled with treats were the only gifts the children received after dancing around the Christmas tree and singing Christmas carols. 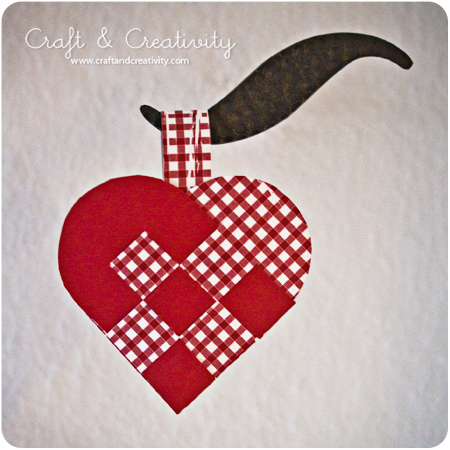 You can find a very easy to follow picture tutorial as well as a template for the Christmas heart basket on the Craft and Creativity blog. I hope the Scandinavian Christmas heart will bring the love and respect to your house! Thank you, Marta! We have been lucky to grow up with Hans Christian Andersen's fairy tales, haven't we! Feliz Navidad to you and your family! What a lovely tradition. I saw a quilt made with this style heart once. Now I know where they got their inspiration. So pretty. I love to hear about other Christmas traditions other than here in the US. Thanks so much for sharing this. Aww, that's cute - I've seen these, but didn't know the history of them. It's always so much more meaningful to know the history. That is such a fantastic and quaint tradition; I just love it!! Traditions are such fun, and I adore hearing about them. :) Thanks for sharing this sweet one! i really learn something new every time I stop by ...this is so pretty , off to see the tutorial ~ blessing to you and yours this holiday my friend!! Really pretty! Love the pattern and colors. This is such a cute tradition! !